As far as Nigerian films made primarily for a cinematic release go, Ojukokoro had a lot riding on its shoulders. For one, it was written and directed by Dare Olaitan, who many know more for his Starwars inspired twitter alias DarthCoal and his often unconventional point of view. Olaitan studied film abroad and in 2014 returned to the country with a very vocal ambition to change how the Nigerian film industry is perceived. There were a few false starts before Ojukokoro was conceptualized, written and filmed. Veteran new nollywood film maker Femi Ogunsanwo of FemmyD films (best known for his boarding school YA drama ZR-7) came on to produce and finance the film in partnership with Singularity Media. It took a year and a half, but on March 17th 2017 the film will open to the public. So what is Ojukokoro, past the hype and the ambition? I’d dare say the best written Nigerian script that has managed only barely to circumvent a system that punishes originality and celebrates mediocrity to make it into cinemas. To understand Ojukokoro, you have to understand how the Nigerian film industry has worked for the last two decades. Rapid advances in film technology opened the medium to literally anyone with a good enough canon and a hastily cobbled script. Nigeria quickly rose to the become the second largest producer of feature length films in the world, outstripping the US, but the repetitive storylines, stereotyped actors and hasty production and post-production meant most of these films had no longevity and little contemporary influence. But it made a lot of money and continues to, provided the film producers can rope in a ‘big name’ to headline their film. 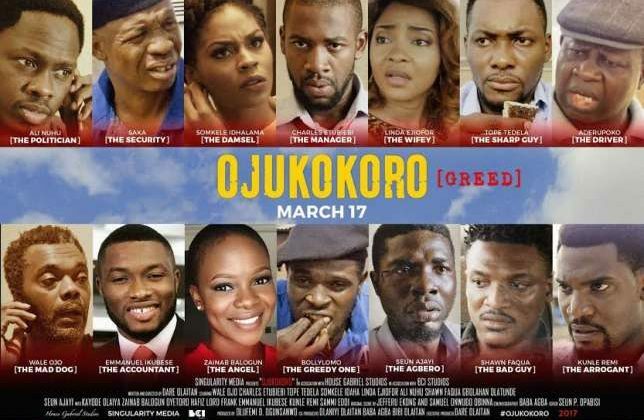 Ojukokoro breaks all the rules; its headlining actor Charles Etubiebi is completely unknown, its big name characters (Somkhele Idhlama, Wale Ojo, Ali Nuhu, Linda Ejiofor and Saka) are all supporting characters and some barely get a scene. The film is set in a facsimile of Nigeria, the film’s directors never commit to a particular location. With that many executive risks, Ojukokoro was going to be interesting no matter the final verdict. The film, ‘inspired’ by the 2015 fuel crisis under ex President Goodluck Jonathan follows in the veins of classic films like the 1995 Francis Duru helmed RattleSnake, tackling the near impossible to pull of crime heist genre. The stage is a fuel station money laundering front, and the film’s roster of characters lives all intersect actively or indirectly as Andrew the station manager, Mad Dog a thug and contract killer and Mr Senator all push their personal agendas with hopes of cashing out. An homage to Tarantino-esque film making; the film is divided into three acts, letting the audience in on the film’s twists long before the characters themselves stumble on to their epiphanies. After a less than stellar first act that included unnecessary voice-over narration and scenes that seemed written to showcase the actor’s second and third languages than advance the plot, the film finally picks up in the second act. Once the characters have been acquainted with each other, and the voice over is thankfully discarded, the film turns away from exposition and gets to work building on the suspense and anticipation that carries through into the third act and washes out into an oddly satisfying finale. The true glimpses of how great Ojukokoro’s writing is comes from the unlikeliest of actors. Shawn Fuqua outdoes himself as Rambo, a thug brought into the orbit of mess of counter heists by the lure of easy money. Switching easily between vernacular, Bini and English, he is sibilant, persuasive and electrifying in each scene. Seun Ajayi, however is the film’s show stopper, completing dominating the screen in the third act as Sunday, the gambling agbero, turned desperate by one too many personal losses. This is scene stealing AMVCA worthy acting, and we expect to see his performance rewarded with nominations from all the major acting bodies. Ojukokoro grazes perfection, but doesn’t quite manage it for two reasons. First, the film could have easily passed the Bechdel test, but it doesn’t. Instead the film’s five female characters (all supporting and with ample opportunity to interact with each other) are used as two dimensional props to explain away the motivations and ambitions of the film’s male characters. Perhaps ten years ago, we wouldn’t have even noticed but now, it stands as a glaring misstep. It is incredibly lazy writing about women that offers scenes like Linda Ejiofor’s character asking her husband played by Kunle Remi to ‘Be safe’ while going to ask for directions at an empty filling station because she has a ‘woman’s intuition’. Second, the film makes the mistake of assuming that its audience is too stupid to follow the interwoven storylines of the film and often goes out of its way to lead the viewer to its zingers, twists and loose ends. An after guiding the audience through the entire film, writers try to throw in a final post credits twist surrounding State C.I.D Officer Jide aka Monday, the Taxi driver and murdered couple that is framed so ludicrously and requires such suspension of belief that the viewer is forced to discard it as impossible. Ojukokoro shatters our perceptions of what a great Nigerian film is and proves a foundation of superior writing will always shine through. It is the closest we’ve come to a perfect film we’ve come as an industry and suggests perhaps, there isn’t much further to go. Ojukokoro opens in cinemas today, go see it.